Carolina Pet Place is locally owned and operated by Chris and Anne Dunn of Winston-Salem, NC. We started Carolina Pet Place with the mission to provide quality pet care in a pet-friendly environment. We’re committed to providing the best pet care facilities and the finest service at the most reasonable cost. 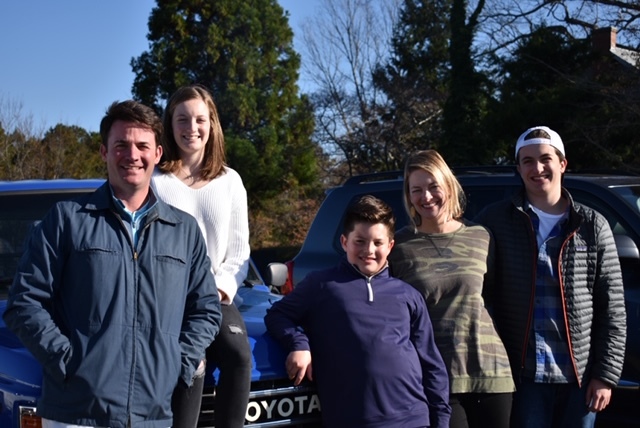 At Carolina Pet Place, it’s all about family. That’s because we realize your pet is more than a pet–they’re an individual and a member of your family. Our staff is here to offer a personalized experience for you and your best friend, no matter their age, breed, or special need. We have one goal in mind: the maximum comfort, safety, and well-being of every pet who comes in for boarding, grooming, and daycare in Forsyth County! Your pet will enjoy a first-class boarding facility and grooming spa when they come to visit. Our affectionate, pet-loving staff can’t wait to meet you! Our award-winning boarding facility was designed by veterinarians and sets the standard for luxury pet boarding. 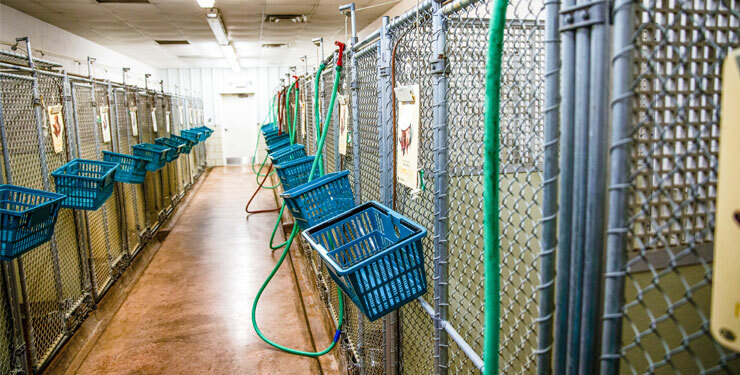 It’s designed to be spacious, comfortable, and provides easy access and clean-up so we can better care for your cat or dog. 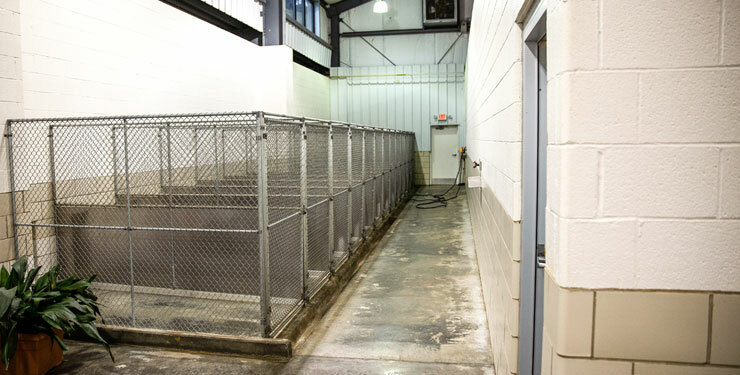 Our standard run is a 4’ x 14’ two-room kennel system developed by Mason kennel systems. Your pet will relax in a climate-controlled 4’ x 4’ area where they’ll have access to automatic water bowls and enjoy the sounds of classical music during the day. Each run has a guillotine-style door that gives access to a 4’x 10’ lanai overlooking a courtyard or a naturally lit window area. Your pet will enjoy comfortable temperatures year-round with heating and air conditioning, and a built-in fan system provides fresh air at all times. Our 24 economy runs are available when standard runs are full. 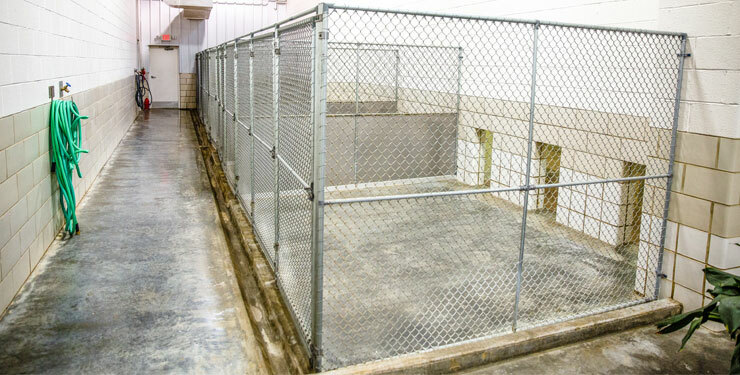 They offer 3’x6’ climate-controlled kennels large enough to be comfortable for dogs up to 85lbs. Economy runs are $20/night and include two walks per day. Our 12 luxury suites are available in three sizes ranging from 100-170 sq ft, providing a spacious area for your pet to lounge during their stay! Each private suite is equipped with comfortable bedding and satellite TV. Rates range from $22-28 per night in addition to regular boarding rates. Give your pet a safe, fun place to spend their day with our Doggie Daycare! 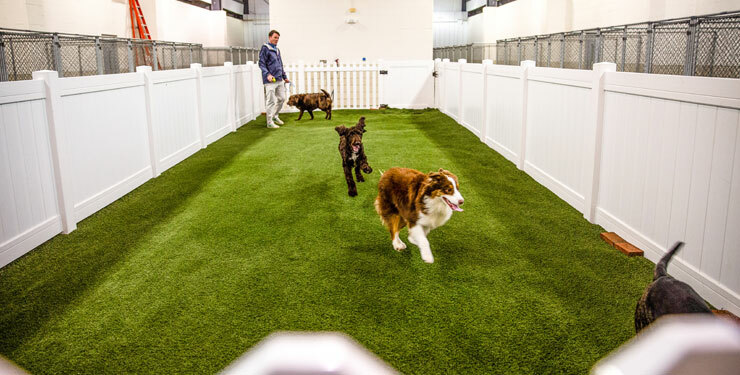 Your pet will spend their day in a group environment with indoor playtime in our Pet Park. The park is equipped with K9 grass, an artificial grass-like surface that’s durable, safe, and clean. We also offer outdoor playtime and naptime in our spacious suites. Our facilities fill up fast during peak seasons (summer, Thanksgiving, Christmas, Easter), so book your stay early!